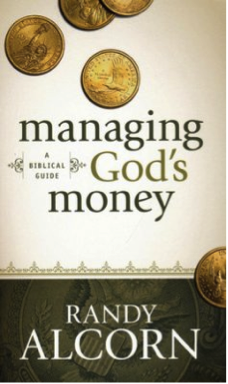 In Managing God’s Money, Randy Alcorn breaks down exactly what the Bible has to say about how we are to handle our money and possessions in a simple, easy-to-follow format. Filled with Scripture references, Managing God’s Money is the perfect reference tool for anyone who is interested in gaining a solid biblical understanding of money, possessions, and eternity. God cares a great deal more about our money than most of us imagine. The sheer enormity of Scripture’s teaching on this subject screams for our attention. In fact, Jesus says more about how we are to view and handle money and possessions than about any other topic―including both heaven and hell. Notes: This chapter covers a baseline of the correct way to shape your mindset on money and possessions. It is very easy to view financial matters as entirely separate from spiritual matters. However, this chapter points out just how related they are. Alcorn pointed out how Jesus talked about money and possessions more than most other things and pays close attention to them. How and where you spend and deal with money is a clear indicator into your spiritual state. Notes: Alcorn point out that if viewing God and money as connected, the understanding of stewardship is the fundamental building block to a biblical mindset. He says that nothing we have is actually ours. God created the heavens and the earth and everything in them. And he is in control of all of it. He even created you, and the bible says, “you are not your own, you were bought with a price.” So, in fact, nothing, not even ourselves belong to us. When you start viewing everything that you have as God’s possessions that he has entrusted you to watch over, it will change the way you give, save, and spend. Notes: This chapter discusses parables about stewardship. There are many of them in the bible. The parable of the shrewd manager, tells us that we should manage our assets in a way that has an eternal impact and an eternal reward- using our resources to extend eternity to others and be a witness. What we manage well in this world, God gives us more responsibility in the next. We are also to use our assets and invest them for growth of his kingdom in preparation for his return. Notes: It is easy to take the two extreme approaches to money that both culture and the church can tell us. One is that of materialism and a total trust and reliance on money, and the other is that money and all things material are evil and a sign of true spirituality is a renouncement of both. Alcorn points out that the view the bible teaches is neither of these. It is that money is not to become your master but your servant that you use as a tool for his kingdom work. It is a balance between the two. Notes: This chapter introduces a look into materialism. The greed it creates surfaces in possessiveness and covetousness. It leads to never being fulfilled, and always wanting more- the exact opposite form what Christ offers us. This chapter points out that earthly possessions do not prepare us for eternity and are useless when we die. Notes: This chapter is exactly what the title suggests: the ten fatal dangers of materialism. They are that materialism hinders or destroys our spiritual lives. It is a broken cistern that can’t hold water. It blinds us to the curses of wealth, brings us unhappiness and anxiety, end in futility and obscures many of life’s greatest blessings. Materialism spawns independence and self-sufficiency, leads to pride and elitism, promotes injustice and exploitation, and fosters immorality and the deterioration of the family. Notes: Alcorn points out in this chapter that sometimes the effects of wealth and materialism on a child can be just as bad as those of poverty. Many times parents try to replace giving their time to their children by giving them possessions. Notes: Prosperity theology, or the health and wealth gospel, is especially dangerous, Alcorn says, because it is false teaching coated in truth. It is true that God can bless those who are faithful to him. However, the bible also teaches that if we are truly living as witnesses to Christ, then we will suffer and be persecuted just as they did to Jesus. In this side of heaven before Jesus redeems the world, we are not to live as if already in him kingdom. Alcorn tears apart the shaky theology of prosperity saying that if God shows favor and reward with wealth and riches, then he sure didn’t like Jesus or Paul. Notes: Alcorn spends this chapter painting the picture of eternity and the newly resurrected earth using scripture. He says that eternity is not talked about enough and it is hard to live with an eternal mindset if you are not eagerly looking forward to living in eternity. With this beautiful, fulfilling picture of eternity, it is easy to live toward that. Notes: It has already been established that God gives us an eternal reward for our godly works after we have accepted his free gift of salvation. In this chapter, Alcorn points out that it is wrong to have a reward as an incentive. God creates incentives, just as parents use with their children. While the reward should not be our only motivation, it is not wrong for it to be one of our motivations in giving and living with an eternal mindset. Note: This chapter was all about tithing and what it really is. Most people interchange tithing and giving, but that is not correct. This is because to tithe means “a tenth part” not to give. So the correct word to use interchangeably with give is, donate. The people in the Old Testament gave much more freely then we do today. They would give nearly everything away. Note: This chapter is about giving as well, but not just a tithe. It is about giving for the good of giving. Going beyond the call of just a tithe and giving because we have too much. Some people give for just “Grace giving” instead of giving because it is needed. Note:Is all about the poor and how it is our job to help them. No it is not our fault to that the poor are in their position, but as godly people it is our duty to help them as much as we can. It tells us that the worst thing to do is completely ignore the poor. Note: In this chapter we learn about the calling of God and does it mean we should leave everything we own. Some people are called to leave their things behind but others are called to serve right where they are. Note: This chapter is all about debt. Is debt good or bad? Well that depends on how it’s used. Our world in the United States is very toxic when it comes to debt. There are credit cards, mortgage payments, car loans, I mean you name it and it can become a debt to you. Note: This chapter is also about debt. But it is just giving a more in depth description on questions about debt. It teaches us about the troubles of credit card debt, how mortgages do not really count as a debt, and how to get out of debt. Note: This chapter is on the future and keeping savings and retirement accounts. It teaches us that it is okay to save. You should save for expected and unexpected instances. Note: This chapter is about investments and gambling. Gambling is nearly throwing your money away. With the lottery you have a very slim chance of winning. Throwing your money away on gambling when it can be given to God is unrighteous. Note: This chapter is about teaching kids about how to deal with money and manage it. Teaching children about associating money to work is very important. Not necessarily giving them money for chores, but teaching them to mow lawns, washing cars, or babysitting. If we can teach children a good work ethic then it will help them to be successful later in life. Note: This chapter is about creating stewards of God’s money in the church. It tells us about teaching others about giving by asking the pastor to talk on the subject. It teaches us about the resources to help people become wise and gracious stewards, about how our giving stories can have an impact, and also how to prepare for a job evaluation.